Prototype: 2 different versions. 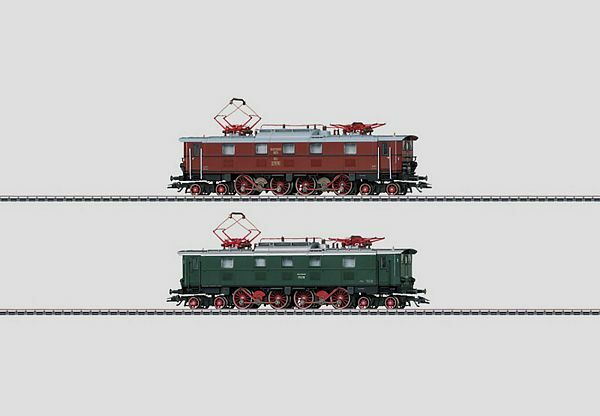 One as the class EP5 in the basic reddish brown paint scheme, as the locomotive looked around 1927, and one in the basic green paint scheme as the class E 52, as the locomotive looked around 1956. Model: Both locomotives have a digital decoder. They also have controlled, high-efficiency propulsion. 2 axles powered. Traction tires. The headlights on both locomotives will work in conventional operation and can be controlled digitally. Both locomotives come individually packaged and marked. A master package is also included. Length over the buffers for each locomotive 19.8 cm / 7-13/16.